It is here, that special time of year when we celebrate the sacrifices made by our nations heroes, especially the heroes who made the ultimate sacrifice for our country and our freedoms and way of life: the men and women in uniform, from all branches of the service. 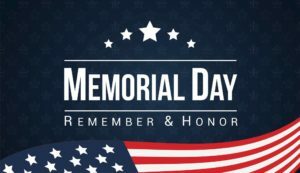 That’s right, Memorial Day weekend and Memorial Day are here, and it’s more than just a time to party and travel with family and friends… It’s about paying tribute to all of those who we have lost while defending our nation and its values. While Memorial Day is hailed as the “unofficial start of summer” and a day when ‘fashionistas’ and gentlemen alike rejoice at the fact that they can now (acceptably and traditionally) wear white shoes, clothing or seersucker fabrics, It is also a lot more meaningful than all of this and a day that should be held in the highest regard. Like most holidays in this country, Memorial Day has evolved over time to stray from its roots and become another day for businesses to hold big sales, car dealerships to sell vehicles at “deep discounts” and neighborhoods to have block parties complete with grills, hot dogs, red, white and blue decorations and, of course, family and friends. And, while all of this is great and is definitely something to celebrate in and of itself, somewhere along the way, too many of us Americans have forgotten the TRUE reason behind the Memorial Day holiday and the weekend that surrounds it. While the practice of decorating soldiers’ graves with flowers is as old as the creation of the soldier itself, many claim that the holiday started during the American Civil War and the first Civil War soldier’s grave ever decorated was in Warrenton, Virginia on June 3, 1861. However, Local historians in Boalsburg, PA, claim that ladies there decorated soldiers’ graves on July 4, 1864. As a result, Boalsburg officially promotes itself as the birthplace of Memorial Day. However or wherever you believe Memorial Day unofficially started: It seems that due to its origins during the Civil War, traditions varied between the North and the South for quite sometime, and although today the day is universally accepted as the same in every region of the country, the South still practices it’s own version, Confederate Memorial Day, on top of the nationally accepted Memorial Day holiday. Until congress officially adopted the name of the day as Memorial Day in 1967, the name varied from state to state and was held on May 30thevery year. By 1968, Congress had passed the Uniformed Monday Holiday Act, which made Memorial Day an official Federal holiday set to observe the sacrifices of our nations military members and honor the fallen warriors who fight for our freedom and declared it to be held on the final Monday of May every year thereafter. Today, we celebrate Memorial Day and Memorial Day weekend by taking the time to thank all of our service men and women for their services and selfless sacrifices and honor our fallen troops with a variety of different events and traditions around the country. Traditionally, the flag of the United States is raised briskly to the top of the staff and then solemnly lowered to the half-staff position, where it remains only until noon. It is then raised to full-staff for the remainder of the day. “The half-staff position remembers the more than one million men and women who gave their lives in service of their country. At noon their memory is raised by the living, who resolve not to let their sacrifice be in vain, but to rise up in their stead and continue the fight for liberty and justice for all”. Parades and other formal celebrations are held across the country, from small towns to big cities, including the National Memorial Day Concert held each year on the lawn of the US Capitol building in Washington, D.C. Over the years, many things about this holiday have changed or transformed, but, the tradition continues and the reason behind the holiday is still alive and well: Paying tribute to those who gave their all for our freedom and thanking our military men and women for all they do and have sacrificed for us to live free! This Memorial Day weekend, as you are traveling, attending a local parade or cooking out with neighbors to celebrate the start of summer, take the time to reflect on our nation’s past and the origins of this special holiday. And, as always, thank any veterans or military members you may know or come across for sacrificing their lives for you, your family and our great nation because without them, none of this would be possible!